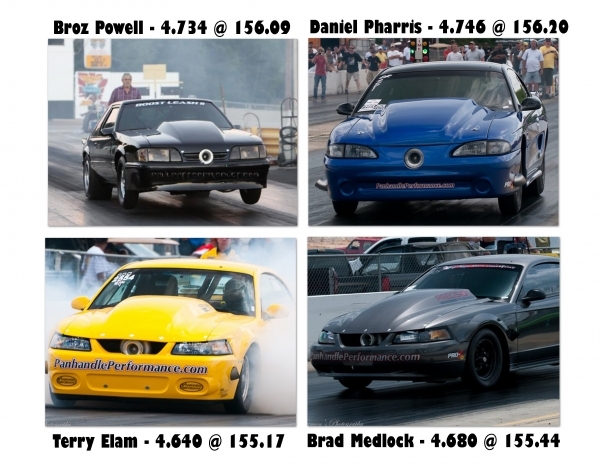 Panhandle Performance engines took FOUR of the TOP TEN qualifying spots in the X275 class at the Holly Springs Fall Brawl, including #1 qualifier Terry Elam with a 4.64 @ 155. Number seven, Broz Powell ran a screaming 4.73 @ 156 with only an 85mm turbo. Brad Medlock came in at number 6 with a 4.68 @ 155, and Daniel Pharris got the number 9 spot and top MPH honors with a 4.76 @ 156. Congratulations to Brad Medlock for going to the finals with his rock steady driving skills.